Goats Beard is a big bold and easy to grow perennial for part shade and perpetually wet sites. 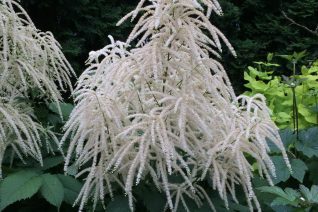 To 4′ tall and as wide with large fountains of pure white flowers in late spring to early summer. Native in seeps and along watercourses, mimic those conditions in your garden and you’ll have success. Long lived plant that develops a woody base. Completely winter deciduous. Fall color is often yellow. Widespread in the PNW. Oregon native plant.